Metal detectors have gained a presence within most retail Codes of Practice for a number of reasons. The most important being consumer safety, closely followed by brand reputation. Metal contaminants can find their way into products at numerous stages of production, and is often through no fault of the manufacturer, however, there a number of ways the manufacturer can prevent these contaminants from getting out into the consumer market undetected. Adding an additional metal detector during process, as well as having one in the packaging area will help to pick up contaminants before the product is fully made and packaged. Contaminants at this stage could have been picked up from farming tools, or transportation devices on their way to the factory. Being able to detect them at this stage can help with loss of product. 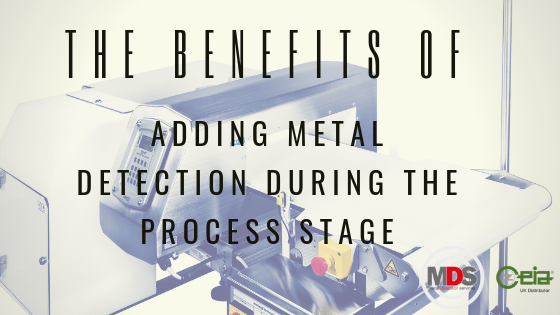 Having an additional metal detector during process is often thought of as having the ability to defend from the front, and protect expensive process machinery further down the line which could get damaged. The Codes of Practice many factories have to adhere to differ between each supermarket, although there are similarities. Some of the CoP specify that the production line must be shut down “if more than one metal contaminant is found (through detection or observation) on any one production line within any 24 hour period; or if more than one metal contaminant (of the same type of metal) is found (through detection or observation) in the factory within any 24 hour period. Any production line shut down can cause a significant financial loss for many factories, therefore, having added protection could become a large financial saver. For more information on our metal detectors or to speak to one of our team and find out which of our detector options are most suited to your needs call us on 0161 286 8755.